Last June, I headed up to Door County, Wisconsin, with Kay Havens, our director of plant science and conservation, for a 31-day trip to undertake our annual fieldwork. “A month at the beach!” you say, thinking it such a treat! Well, yes and no. Four undergraduate students in our REU program joined us to track literal life and death events in two plant populations on the dunes of Lake Michigan. The dunes can be more than 20 degrees Fahrenheit hotter than ambient temperatures, and we work in the interdunal swales, where no lovely breezes off the lake can reach us. It is often well over 95 degrees in the dunes, even if it’s a balmy 75 degrees in Sturgeon Bay. But, no matter—we are on a mission! 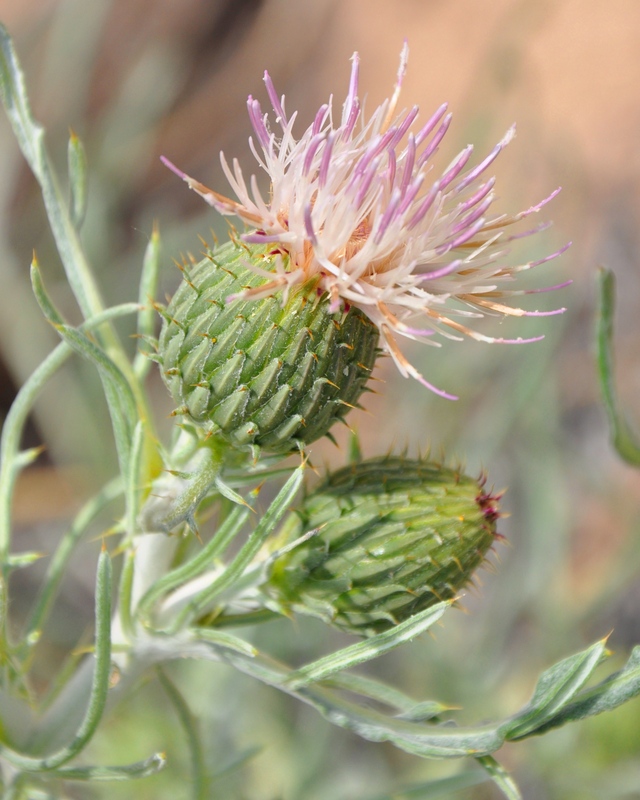 On days with the hot sun both beating down and reflecting up from the sand, we observed, measured, and recorded the births, deaths, and reproductive successes of one of our favorite plants: the threatened pitcher’s thistle (Cirsium pitcheri). We find every seedling we can, and place a flag next to it to help us keep track of the ones we’ve counted. We don’t want to miss a single one. 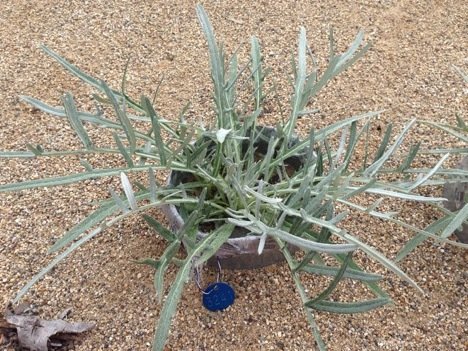 Each seedling is a measure of successful reproduction for this monocarpic perennial. Monocarps—plants that only flower once before they die, are completely dependent upon producing as many successful offspring as they can, all in the quest to ensure that they just replace themselves. When all plants successfully replace themselves, a population is stable. Just to replace yourself is a monumental undertaking for a plant that flowers once and then dies. Especially for pitcher’s thistle. 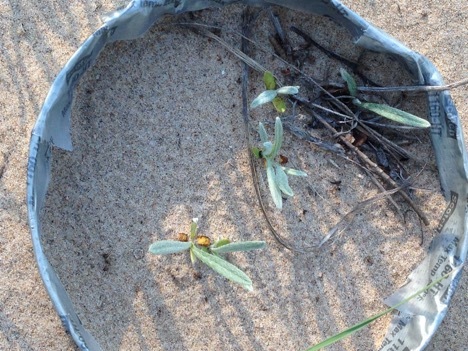 The dunes are a harsh environment for a tiny baby plant. Many of them die—exposed to the heat, and without enough water to sustain them. We estimate that fewer than one in ten seeds germinate and survive each year, and in some years, only a small percent of those survive the winter to become a juvenile plant the next year. That means that each flowering plant must produce many seeds to replace itself. The good news? Generally, if a seedling survives to the juvenile stage, it has a much increased chance of survival to make it to the next stage—a vegetative plant—and the vast majority of those go on to reproduce at some point. 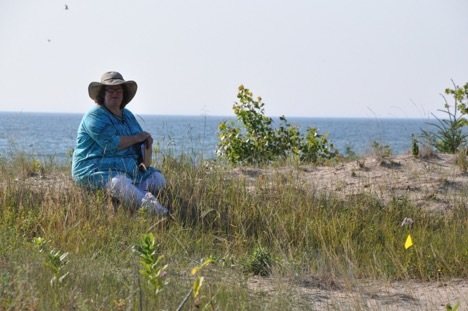 Kay Havens is ready to record data at Ship Canal Nature Preserve, owned by the Door County Land Trust. However, seed germination and seedling survivorship and growth depend upon two things: where you come from and where you live. To look at this, we took 100 seeds from each of our two study populations and grew them in “seed baskets” in our study garden at the Chicago Botanic Garden. We also grew the same number in seed baskets at their respective home sites. Regardless of population, they germinated and grew very readily in our study garden. But there were very stark differences at our study sites in Door County: seed germination was 39% at one site, but only 9% at the other. Pitcher’s thistle seedlings sprouted in one of our seed baskets at the Ship Canal Nature Preserve. The pair of yellow-green “leaves” opposite each other are actually cotyledons, or seed leaves, and are the first photosynthetic organs to emerge from the seed during germination. These are pitcher’s thistle seedlings that have grown very large under the favorable conditions of the test garden on the south side of the Plant Science Center. In just one growing season, they have grown as large as plants three to four years old that grow under natural conditions. Why the difference? Well, our first site is definitely more hospitable! Even we are happier to work here. It’s not nearly as hot, and the dune structure is more flat, so the breeze off the lake makes things more pleasant—for plants and people alike! And it appears to this observer’s eye that there’s more water available close to the surface here. This year, there are two large patches in the dune that have been perpetually damp. In contrast, our second population is literally high and dry, making life hard for the little pitcher’s thistle seedlings. How does this affect the prospects of these two populations overall? Stay tuned! We’ll let you know when we have finished our analysis of the long-term trends at these two very different sites. One plant, two places—offering a fascinating glimpse of a life of contrasts.